“A person standing alone can be attacked and defeated, but two can stand back-to-back and conquer. Three are even better, for a triple-braided cord is not easily broken”. Often quoted at weddings in reference to the threefold union between husband and wife, implying God is at the helm; Biblical scholars differ on the exegetical context of this scripture. Although equipped to discuss said matters theologically, I intentionally refrain from such debates. 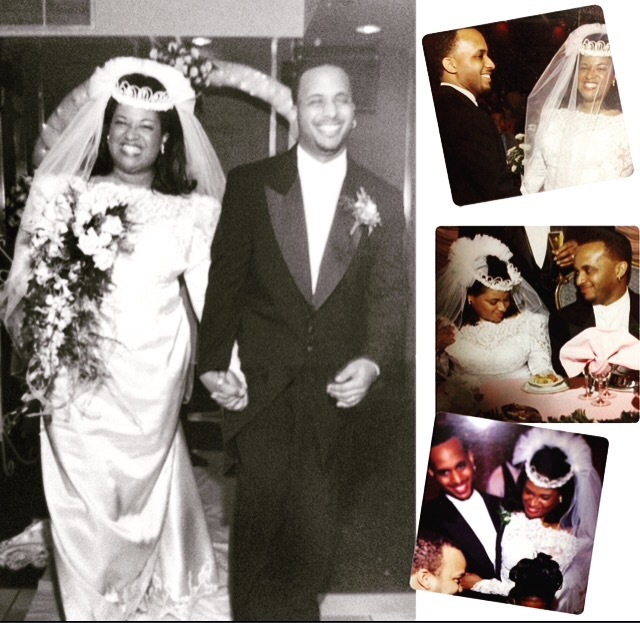 As a woman who has dedicated the last 22 years of her life to the man holding my hand in the photo above; I can’t help but notice how wide our smiles were the day we exchanged vows 18 years ago, on March 7, 1998. Generally speaking, one’s smile can be altered by a myriad of factors. Sabotage from within could include neglect stemming from a self inflicted poor diet, to a lack of daily care and regular checkups. Often smiles are damaged by the impact of unwelcome catastrophic injuries caused by external hits. Weddings are big business and Black Love is a great hashtag but there is real life to be done after “I Do”. Yes, being married to a professional musician is a unique life song all its own but incredible sacrifice is required in any relationship, no matter what field the spouse works in. In order for a gift, offering or decision to be considered a sacrifice it has to COST the giver something greater than themselves. As it pertains to marriages of faith, ALL components of the THREEFOLD CORD must be selflessly present and working synergistically even when no one is looking. Not the feigned, photo op appearance of putting in the work. Not 50/50 but 100/100. Anything less can cause the ends of the cords to become frayed. If discord arises however, it would be a fair assessment that one or more of the cords is not on one accord with God because He is the immutable cord. If I’ve learned anything over the last few years, it’s to not speak for anyone but myself. There’s a low key haughtiness that comes with experiencing new love, good love or with what you’re under the impression is, exclusive love. Unforeseen life lessons teach you very quickly to temper the language of “we” and adjust your sails in the realm of humility accordingly. I’ve also learned that you have no control over how someone responds to the weight of your love. A savory, mouthwatering, tailor-made meal can be prepared to perfection but if it’s served to one who lacks interest and an appetite for that meal, it will be shunned for empty calories every time. While Spring cleaning, I came across this picture and other nostalgic items including a copy of the “How Well Do You Know Kevin & Ericka?” Trivia Quiz we played with our guests at our 10th Wedding Anniversary party! About 80 of our closest, many who traveled from out of town, their families, tons of hugs, food, lots of laughter and a banging Live DJ packed an Art gallery back in Philly and it was a night like NO other. Tears rolling down my sentimental eyes, falling on the quiz I thought aloud, “I have not surrendered my love to any man more deeply than I have Kevin Arthur”. Not Kevin Arthur the musician, producer or indie artist. Just. Kevin. You see…serving unconditional Love in the trenches with boots on the ground, nose deep in life and perpetually dodging fiery darts at eye level, with no cameras around; is not for the feeble. I’ve discovered it can be hard for a partner to receive unconditional love in this performance driven society we live in. But that is the type of love I have for him. In sickness, health, richer or poorer, gigs no gigs, onstage, offstage, tour, no tour. Spot date, no spot date, endorsements or not. Whether he was getting paid serious coin a week or in gas money, it mattered not. Whether he was holding my hand on the red carpet at the MTV Awards or holding my hand walking to the corner store in the hood, it mattered not. I just loved him for him. Like pain, the thing about LOVE is it demands to be felt. You don’t love someone that deeply without a deep pain to match when things go awry. The amazing thing about LOVE however is it’s an indelible healing entity. The idea of someone not only having your back but standing back to back WITH you conquering ANYTHING is an extraordinary image. But it takes work and both partners working together, giving it their all. Grateful for every tender moment we’ve ever shared. Grateful for kisses in the rain without an umbrella. Grateful for him taking me to and from work back in the day. Grateful for how he took care of me during horrible morning sickness with our 6 week early preemie baby girl, rubbed my back when carrying our full term 10lb 7oz baby boy; and wiped my eyes when the Dr. explained our youngest boy wouldn’t seen the light of day. Thank you Kevin Arthur. I’ve learned more about the intricacies of music and nuances of life from you than any class I’ve sat in or stage I’ve performed on. Love. Been hurt by it. Love. Been healed by it. God’s love. Absolutely nothing like it. Writing is so therapeutic. I don’t know what tomorrow holds but God holds me and I’ll be holding a pen. Photo Credit Our wedding day captured by Glenn Derricotte. This is an extraordinary post, Erika. It is love from the practical experience of commitment and sacrifice and humility.